As the weather cools down, frost can become a very big threat to some of our favorite warmth-loving plants. What can you do to keep your lawn healthy? 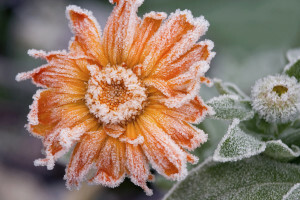 Read on to learn how to protect your plants from frost this autumn. How can frost damage plants? Frost damages plants by causing ice crystals to form inside of the plant’s cells. The cells of a plant are made mostly of water, and when the water inside of the cell freezes, the cell can burst, disrupting movement of fluids through the plant and preventing water from being able to travel to other plant tissues. Leaves that have been damaged by a frost will appear water-soaked, shrivel, and may turn black or dark brown. The first step to preventing frost damage is to understand the types of plants that are in your yard, or do research on the types of plants you are looking to install. Because we are able to purchase plants from all other the world, it is important to know what your climate zone is, and what types of plants are able to survive there during the winter. 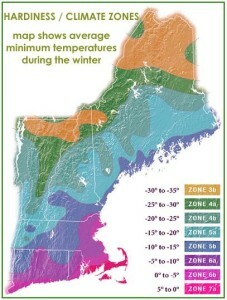 Refer to the map below from Gardening In New England to determine what zone you live in. Select appropriate site for your plants. Avoid open, exposed, low-lying areas. If possible, plant less hardy plants near a south or west-facing wall of your home, which absorbs heat during the day and radiates it at night. Use bed sheets, drop cloths, blankets, or plastic sheets to cover your vulnerable plants. Use stakes to help hold the covering up, ensuring that the covering does not lean against or touch your plants. Always remove the coverings when the temperatures rise again. For short cold periods, low plantings can be covered in straw or leaf mulch. This is a great way to make use of your fall leaves! Again, remove the as much of the mulch as you can when the threat of frost is over, as you want to make sure that you plants have access to important nutrients. When frost damage does occur, don’t assume that the entire plant will die as a result. In warmer climates, it is not uncommon for a plant that suffered some frost damage to produce healthy new growth the following year. So if you think that frost damage has occurred on your plants, wait to see what happens. A dead leaf or two does not mean that the entire plant will die as a result. For more great tips and tricks about landscaping and landscape management, be sure to check out our blog. If you are interested in learning what types of plants will work well for your home garden or lawn, contact the experts at Greener Horizon. We can help keep your lawn healthy and looking beautiful all year long!